Pro-audio engineers Lee Taylor and Mallory Nicholls founded Leema Acoustics in 1998, with the metal-jacket Xen sub-miniature monitor. 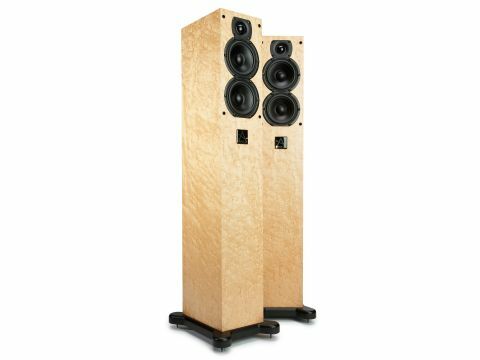 Several other models (and a new range of electronics) have appeared since then, the latest being this £2,245 per pair Xone. This shares similar looking drivers and the same footprint as the tiny Xen, with an extra cone driver to augment the bass. Our samples came finished in a beautifully figured, pale birds-eye maple (darker rosewood and ebony are options). The speakers are also compact, standing just 89cm tall and - thanks to the use of tiny 100mm-frame main drivers - look slim and discreet from the front. The sharp-edged enclosure is very crisply styled, and the drivers are flush mounted, though the thick-framed grilles are better left in the carton. The small enclosure footprint could potentially compromise stability, so a proper additional plinth is supplied, locating the spikes well outside the enclosure. Spike accommodation is impressively secure, though no lock-nuts were supplied. The magnetically screened drivers, loaded by a rear port, have large magnets, open unobstructive baskets, and 80mm doped paper cones, while the tweeter has a fabric dome diaphragm, quoted as 25mm diameter. The cabinet is damped internally with bitumastic panels, acoustic foam liners and natural wool. Wiring is Nordost Micro-Mono-Filament, and the bi-wired crossover has Clarity Cap capacitors. Soldering is fully RoHS compliant, and the twin terminal pairs are fitted conveniently low down at the back. The Xones worked best when positioned well clear of walls, where they delivered a dry, cool bass alongside forward overall character. Detail is particularly clean and coherent, yet is also sufficiently strongly projected that poor quality material, such as recordings with heavy compression, can sound overexposed. More warmth, weight and bottom end impetus would definitely be welcome, but the Xone has fine inherent agility and an impressively clean, crisp bass that's free from overhang. There's no chestiness with male speech, though some orchestral textures are slightly thickened, and cellos sound dry and slightly lacking in 'body'. Fine enclosure control delivers a wide dynamic range and keeps boxiness suppressed. The very modest drive unit area - two 80mm cones have a smaller combined area than a solitary 165mm driver - inevitably limits the amount of bass punch and drive this speaker is able to deliver, despite extra assistance from its reflex port. In truth, rather more muscle to supply some genuine visceral impact would be welcome, and although music has good coherence and timing, it could have more dynamic grip and tension. The balance is better suited to smallish rooms, and the dry character won't suit every taste, but this remains an engaging and musically literate little speaker. Imaging is top class, with fine precision and focus, and the Xone proved well capable of distinguishing the recording quality of any given disc. A degree of nasal coloration was evident on speech, but that doesn't prevent it sounding thoroughly entertaining when playing music.